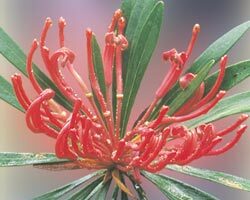 Monga Waratah a shrub up to 4 metres has a very small distribution around the moist forested areas and creeks of the Mongarlowe River near Braidwood in New South Wales. Its flower has the appearance of an open hand reaching out. This Essence can help a person find their inner strength. It addresses the negative conditions of disempowerment; of being overly needy; of feeling not strong enough; of feeling unable to do things alone; of always needing the strength and support of others; feeling choked or stifled in situations or relationships and feeling not able or strong enough to leave. This Essence is very much addressing co-dependency as well as strengthening one's will. Consequently, it can be thought of when working with addictions. This remedy helps one to reclaim their spirit.